Yoga may not seem a closely related topic to Fair Trade economics. However, in the same way as the Triple Bottom Line expands accounting thought into a holistic cost-internalizing system, venturing beyond conventional economic philosophy may require a shift in thinking in a way related to an understanding of yoga’s value. So, briefly, with that in mind, this article on Fair Trade begins with a reference to a recent article at NPR’s WBUR website which talks about a yoga class at Boston University’s Medical School. Thus prepared for unusual and holistic thinking, it is perhaps possible to be less cynical to learn that in recent years, McDonalds´ restaurants in New England, Dunkin Donuts, and Starbucks have all begun selling some Fair Trade certified coffee. To my knowledge, Starbucks lead them all. Fair Trade is a certification comparable in scope to organic certified foods, or FSC certified paper products. While organic certification refers to factors like the use of chemical pesticides and fertilizers and FSC to responsible tree harvesting, Fair Trade addresses the price paid to the small farmer, or even a farm laborer. Whatever brand of coffee McDonalds served in the past, the company decided at some point in the last few years to use Newman´s Own Second Generation organic and Fair Trade coffee roasted by employee-owned Green Mountain Co. Driving to the first U.S. Solidarity Economics Conference in March, 2009, I finally could confirm it myself. McDonalds did mention something about the coffee being Fair Trade. If most people think of coffee, I think the generic or company association is common. Brand names like Maxwell House and Folgers were prominently advertised when I was growing up a few decades ago. Before I left for Brazil, Starbucks had already claimed a lot of recognition on many U.S. streets. In supermarkets, Nescafé is one international brand, part of industry leader Nestlé´s line of coffees. Maxwell House is still around, and now part of Kraft. In one 2011 Bloomberg news item about the giant coffee corporations, Sara Lee Corp.’s intention was to become the second largest coffee company in the world by surpassing Kraft, although they needed to more than double their market share. Nestle was comfortably in the lead with 22% of global sales. While I found no indication of Fair Trade in Sara Lee’s coffee sales, a little research at their website recently showed that they do discuss sustainability through stakeholder engagement in terms of their commitments and involvements with many non-profit groups, including some I personally recognize like the Interfaith Center on Corporate Responsibility and the ILO Declaration on Fundamental Principles and Rights of Work. I am confident that to one degree or another, those kinds efforts are having some types of positive impacts. Nevertheless, such groups’ efforts are not usually as direct as Fair Trade’s. The ILO’s influence, for example, is limited to conventions supporting minimum salaries in nations, which is not legally binding, nor a guarantee of a living wage. A living wage, unlike a salaray minimum, guarantees the recipient employee enough to meet their basic obligations, and provides the special impact of Fair Trade certification by making this issue essential. Small farmers and plantation laborers producing export crops like coffee, cocoa-chocolate, and bananas are paid for their crops or labor and have suffered chronic poverty because of low prices and wages. I remember in 1994 the uprising of the Zapatista movement in Southern Mexico and immigrant issues in general, and shortly afterwards, the Rwandan genocide. These and other situations are not usually described by the popular corporate media in terms of their full socioeconomic causes, the profit-maximizing policies of corporations, their industrial governments, and other privileged groups and the socially excluded small farmers who have been disadvantaged by international business as essential elements in the making of these social conflicts. Moreover, free trade agreements and related policies in international arenas like commodities markets played very direct and devastating roles in those violent events. The basic principle of Fair Trade is significant in that its certification is a visible demonstration of a standard promoting a living wage income for small farmers. Fair Trade certification began when a church foreign aid adviser returned to Holland and spurred the organizing of a non-profit Fair Trade label in the late 1980s. The practice was taken up in other nations and by 1997, an international Fair Trade association focussing on food products was established. Oxfam is another non-profit NGO that has worked on food issues since being founded during the Second World War. After the creation of Fair Trade certification by others, Oxfam began to include an additional issue in their lobbying and activism against policies which hurt small farmers internationally and for similarly diverse application of fair policies. In fact, Oxfam has not only lobbied corporations to use Fair Trade certification, but they have begun their own line of Fair Trade certified products. Oxfam Fair Trade mints from Cuba are one example that turned up in my travels in Belgium. However, Oxfam Ireland has stopped retailing the Oxfam brand, probably because such retailing makes Oxfam a direct competitor and interferes with their advocacy work. Oxfam’s lobbying of corporations has had some modest direct impacts, however. A major example is Nestlé, which declared in 2010 that they would begin selling an extremely limited range of Fair Trade certified products, such as one of their U.K. Kit Kat varieties of snack bar. Oxfam published a statement in response to recognize the importance of Nestle’s decision, but also to make up for Nestle’s failure to identfy the NGO´s role in advocating for the company to use Fair Trade. Oxfam also clarified that Nestle is still only certifiying a very small amount of their products. The granting of Fair Trade certification to enterprise’s which only apply it to a portion, especially a miniscule portion, of their products has generated many critics. Still, keeping clear the limitations, Nestlé´s decision, along with some other large corporations like McDonalds and Dunkin Donuts does provide the opportunity to discuss the Fair Trade issue with more visibility. 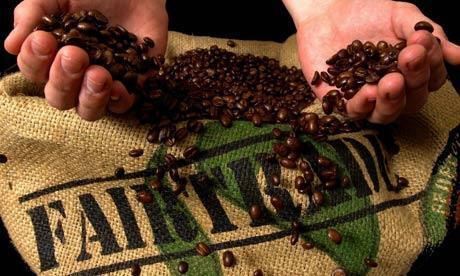 Starbucks, moreover, hás been one of the worlds largest purchasers of Fair Trade coffee, although still in keeping with the other companies the category is only a small percentage of their total coffee purchases. Pret e Manger, however, is a newer food service chain which has gone even further than most international chains and approximating some independent cafe’s with their menu boards declaring their interest in both Fair Trade and organic certifications. Another company, The Body Shop of the U.K. founded by Anita Roddick in the 1970s actually pioneered policies with the same intent as Fair Trade’s in making their creams, lotions, and shampoos. Nestle, McDonalds, and Dunkin Donuts’ limited use of Fair Trade certification has happened in recent years. Many small business importers, however, are responsible for building the label even earlier. The U.S.’s Equal Exchange is a good example of a company to contrast with the giants. They were founded in the late 1980s before Holland’s Fair Trade initiative, but with a similar intention. Three acquaintances at a Boston area food co-operative hit upon an idea to start a socially responsible food import business. As a new company start-up, they paid fair wages to small farmers to grow organic foods. They even defied ideological politicians when they successfully challenged U.S. Reagan-era embargos against Nicaragua. Equal Exchange even then proceeded to adopt the very social democratic co-operative business model that they promoted. Fair Trade certification often involves a requirement for small farmers to organize into a co-operative enterprise, which represents a member-owned democratic business model. The first modern co-operatives were formed in Europe in the early years of the industrial revolution, and have their own associations. In the early 1990s, the thriving start-up Equal Exchange then incorporated this Fair Trade practice by reforming their company from the conventional hierarchical model of a privately-held company without turning to any of the risks of issuing public stock. They instead became an employee-owned, co-operative enterprise with democratic policies. They now have revenues in the millions of dollars. While I think anyone and everyone can become involved in starting a similar co-operative business, Fair Trade certification creates choices for everyone first as a consumer. A simple purchase choice then begins to go a long way. Small New York independent cafes like Brooklyn’s Ozzie’s and the growing Think Coffee of Manhattan have been empowered in their social business, while giants like Starbucks have been given a means at least to offer progressive alternatives. The tangibility of Fair Trade products then becomes a means for others to join in selling an alternative. On a recent web search by the author, D’Agostinos, a mainstream supermarket chain in New York City, had become the first of its kind to sell Newman’s Own Second Generation organic and Fair Trade blends, the same sold at New England region McDonalds. This author himself had fun in places like the U.K., Switzerland, and Germany looking for Fair Trade goods in stores and restaurants. I can recommend Planet Organic in London, the Gorilla Café in Berlin, Co-op Supermarket in Geneva, and for that matter Think Coffee in New York City, for example. In terms of consumer organizing for more conscious consumer living, various associations have been organized by concerned people. Voluntary Simplicity and Slow Food have been organized to promote responsible consumer lifestyles. The New York City Fair Trade Coalition has been advocating with municipalities and conducting fairs, while Equal Exchange’s own interfaith program has been promoting the use of Fair Trade by churches, synagogues, and other interested places of worship. Food co-operatives also involve community gatherings and can be found in many vicinities, and these are usually excellent places to learn about democratic business. My experience at New York City’s Park Slope Food Co-op, one of dozens nationwide in operation since the 1970s, was an amazing way to learn about socially responsible business. See the directory at coopdirectory.org for a comprehensive U.S. list. On the internet, Oxfam and FLO aren’t the only non-profits advocating Fair Trade, and a look at other sites like Green America and Global Exchanges’ will give a bit of a rush of blood to the head, to quote the lyrics of Fair Trade advocate Chris Martin of Coldplay. A good number of articles and books on the subject have been published, moreover. See Julie Grossman’s piece on-line, “Mountain Groan,” about Fair Trade’s role in helping Mexican farmers, and Laura Fraser’s New York Times story, “Coffee and Hope Grow in Rwanda,” and William Neuman’s recent report, “A Question of Fairness.” Daniel Jaffee’s book Brewing Justice, Jacqueline Dicarlo’s Fair Trade, and Michael Conroy’s Branded all can or are reported to provide helpful insights in understanding the real world situation surrounding Fair Trade. The well-traveled and well-educated David Korten’s books like The Post-Corporate World also offer great insights into these issues. The claims of many ideologues have stated that “There is No Alternative (TINA)” to capitalism or that the free markets controlled by big corporations and profit-maximizing are the real reasons for quality and prosperity in the world. Without examining the deeper and broader historical and social elements of these claims and their counterparts in movements like the World Social Forum, it can be simply seen that Fair Trade certification is a call to all and everyone that enlightened self-interest includes altruistic qualities só that fair play can save the day. The right way. There are objections by those who think about economics according to certain theoretical premises, sometimes called neoliberal, neoclassical, or market fundamentalism. Fortunately, the practice of Fair Trade shows that there cccccis an important difference between theory and practice, and even science and theory. Scientific theory develops through the testing of hypotheses to develop reliable theories. Gandhi, of course, is a fantastic example of this process in human affairs. No theory of international law, for example, can be true if it does not account for real individuals in associations like a man in a loincloth acting on behalf of real people who have been marginalized by laws. Gandhi matched conventional theories because he rose to a position of a state actor, but it is the new theories which recognize individual and social dynamics that more accurately approximate measurements and explain his appearance and influence. Likewise, no theory of economics can be considered scientific if it imposes its law instead of deriving its law from comprehensive experience and experiment. Similarly, I like to remember that corporations that are big now, whether Nestle, McDonalds etc., were once start-up enterprises by individuals who maybe had partners. Conversely today, one or more executives at those now large companies show that Fair Trade practice in fact doesn’t end with small businesses and start-ups. As Anthony Chiaravallo at this site likes to emphasize in particular, there are also real people in corporations open to reform corporate policies and challenge conventional wisdom. So, if together you and I remember people who have already founded social enterprises like Honest Tea, Steaz, and Equal Exchange, and further back long-lasting food co-operatives and the Body Shop, perhaps we can see ourselves in their places to the extent that it applies to the real situations of our own lives. This way the social entrepreneurial spirit can be applied to the next right step for any one of us, you and me in our consumer choices, actual entrepreneurship, or other spiritual and civic activities. For example, I can recommend the Unitarian-Universalist interfaith congregation at 35th St. in New York City, where I am a member, and the nearby Episcopalian Church for the Fair Trade coffee they serve. Recalling yoga’s popularity in a recent NPR report, the Integral Yoga Center on 13th St. is also another one of the great places to contemplate the holistic certification practice begun by some Dutch NGOs in the late 1980s.